I have a louis hansen barber chair. The chair was my wifes grandfather’s who was a barber in the 1940s and 50s. He bought it used back then for around $100 CA. if anyone has any information about this chair that they can share with me it would be much appreciated. I also have pictures if needed. Also i have looked allover the chair for a model number but can’t find one. Thank oftentimes with the older barber chairs like that if you lift up the seat cushion and you look on top of the Hydraulics there’s usually a plate on there that says the year it was manufactured in the model number. The footrest broke on our chair too and I believe my husband took it to the local muffler shop and had it welded. Any welding company could do it. Hello. I have a Louis Hansen, oak barber chair. I’m in the process of restoring it.Do you know anyone who wound happen to have a part list.The chair doesn’t rise or lower. I have photos, can foward. Hi, I have a Louis Hanson barber chair in good condition that belonged to my father in law who worked in the family barber shop. The barber shop was founded in 1908-we are looking to sell the chair, does anyone know where to price the chair, and/or where the best place to sell it would be? I would b interested in your chair. Please send pictures. I have inherited a Louis Hanson barber chair that is in good condition. The hydraulics are functioning and very smooth in action surprisingly. It is upholstered in a red velvet cloth and has a gold foot plate. I want to have the chair appraised and am also interested in selling it. All suggestions and interests are welcome. Thanks! 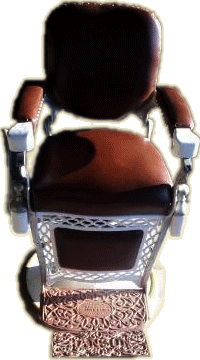 Do you still have your Hanson barber Chair? I have one that I am selling and it is in very good condition; also diamond tufted red velvet. I have no idea what someone may be willing to pay but I am pricing it at $3,900.00. Antiques are not a hot item at that price in Arizona, but I have never seen one as nice as the one that I have. I would like to hear from you about yours and what you think the values are. Hello have you decided what you would like to have for the chair? I am a professional barber and I’m in the process of buying old barber chairs as I can afford them to put in my barber shop. I recently became a business owner and I want to create a vintage barber shop where people can appreciate how beautiful the old barber chairs used to be. Just let me know how much you want for it. And could you please send me a picture so I can see what it looks like that would be great. Have a blessed day thank you so much. I have a Hanson Independence barber chair in great condition that I am interested in selling. Please send me your email address so I can provide you with pictures and more specifics. I have two antique barber chairs made by Louis Hanson. They are the independence version (which apparently is quite rare). I know I can get at least $2,500 for them on Ebay but I am wondering what their real value is. One of them is missing springs but the other one is in mint condition. Pictures available. All feedback welcome. I’m looking for old rare chairs. Can you send me a picture if you still have it. Also looking for a Koken “Congress” Barber chair. Would like he to find 8 of them. I have a Hanson barber chair if anyone is interested. Tenho uma cadeira Louis hanson, muito antiga, empalhada e em em bom estado de conservação. I would like to hear about your experience with pricing/selling your chairs. I am currently putting mine up for sale at $3,900.00. It is a beautiful looking chair and fully functioning Hanson Independence in diamond tufted red velvet and original oak. Hello I’m looking for old vintage barber chairs to put in my barber shop. I recently became a business owner and I’m creating an old authentic barber shop so that people can come in and appreciate the beauty of what the barber chairs used to look like along with all the other things the checkered floor and the old vintage mug racks on the wall and all of those types of things. Could you send me a picture of the chair that you have? That would be wonderful thank you so much I really appreciate it. Have a wonderfully blessed day. I purchased a Hanson and had it restored by Pacific Stove works in Santa Barbara. Skip did a great job and it is truely a work of art. He had all the metal pieces that were rusty nickle plated as the original and re-porcelined the pieces that needed it. I had the leather refurbished by another individual. It is in my wife hair salon and gets many comments. I would say that you will get what the market will pay. It was not inexpensive to restore, but it is an awesome piece of history. Do you think I am asking too much? 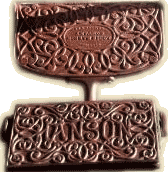 Manufactured by Hanson in Chicago nearly 100 Years Ago! The story behind this “Independence” model “Hanson” barber chair begins with a Dutch immigrant named Louis Hanson. He migrated to the United States in 1865. Louis worked in factories as he moved from Maine, to Massachusetts and then settled at Chicago in 1867. There he began the Hanson Manufacturing Company producing furniture, home décor such as mirrors and picture frames, and barber chairs distinctly known by his own unique design. This “Hanson Barber Chair” pictured here is beautiful, fully functional and approximately 100 years old. After its manufacture, this particular chair is known to have made its way from Chicago to Pennsylvania. This chair was found in the Makrauer’s Barber Supply House at 114 Smithsfield Street in Pittsburgh near 1918. This chairs history for the next 60 years is largely unknown, but it is known that during those years this chair did travel across the United States and eventually arrived in the “gold rush country” of northern California. This chair was found in the Sacramento River town of Red Bluff in the Italianate Victorian building pictured here. This is the Independent Order of Odd Fellows Lodge which was built at 342 Oak Street in 1882. The lodge room is upstairs and the first floor is several small shops that are rented out to produce income for the lodge. This chair was last found in one of those shops in 1978 and it has been held in private collection since then. thanks fore the history of the manufacturer. i also have a hanson chair that i am going to sell. would you have a picture that you can email me and an approximate value ? I have a Louie Hanson chair that is for sale, it is in very good restorable condition, with only one small chip on the porcelain arm of the chair, everything else there including the head rest with paper attachment. Will need to be picked up in Indiana N.W. Looking for rare antique Koken “Congress” Barber chair. Would like to find 8 of them. Please Leave any info you may have. Thank you. I have a Hanson barber chair that is in good condition. My father used it in his barber shop. The hydraulics work, the arms are white porcelain, and the seat is leather. The general condition is very good and operational. Looking for a price and buyer. I have a 1910’s Hanson barber chair in good condition~~~~~except? The hydraulics always worked. Now they don’t. Somehow it was left in up position and I tried the handle to get it back down and it will not go down. I cannot get the handle to the position to bring it down. HELP??? Have a beautiful Louis Hanson Oak/Hydraulic barber chair. Red velvet diamond tufted fabric and it is fully functional. I honestly have not seen one as nice as mine at anytime in person or on line anywhere. I want to sell it to raise money to help pay my seminary expenses. Does anyone have advice on how to best advertise or know of any buyers? I intended to ask somewhere in the $3,000.00 range. Thank you. I have a Emil J Paidar Barber Chair with the White Arms and Red Cushions and Head rest in great condition. Asking $2,000.00 but neg. I am in the Chicago Suburbs if anyone is interested I can send lots of pictures. Need to sell my Louis hanson barber chair. Black leather on seats, porcelain arms etc. I have a Louis Hanson barber chair for sale if anyone is interested. I can send pics. Last time we checked the hydraulics still worked and it has the head rest and all the parts. It has the porcelain base etc. Black vinyl or leather upholstery (cannot be sure which). I do think there is a rip in the head rest upholstery chair. I am in Dallas area, with a Louis Hanson barber chair for sale, porcelain arms and base, hydraulics are in good working order; original rare child booster seat included; can send photos upon your request. Good day. I lived in Vernon B.C. Canada and I own a Louis Hanson antique barber chair in very good condition. I can not find any information on the chair which will indicate when the chair was made. I read there should be a plate on top of the hydraulics but there isn’t one. Is there any other way to determine when or where the chair was built and the model. It has a head rest complete with a partial roll of paper. The chair appears to be identical to the one at the beginning of this article. Thanks and I will appreciate any information you may give me. Hello, I am located in Alberta, Canada and I own a Louise Hanson antique barber chair in very good condition as well. It is upholstered in red velvet. I am unable to find the plate indicating when the chair was made. I am also looking for the value of the chair. I am in Okotoks, Alberta. I am considering selling my Louis Hanson chair. It is in good or better condition. Couple small tears, a couple chipped porcelain spots. Looks really nice. I am torn between putting money into restoration or selling it as is. If anyone wants pictures let me know. I don’t think it would take much to get this finished.